The previous post illustrated why trading is challenging, as markets change their volume, volatility, and trendiness--sometimes quite radically. On Friday, for example, SPY traded with a true range of over 3%, three times the average daily true range of the previous 20 trading sessions. Volume expanded to over 345 million shares, also three times the average volume of the prior 20 sessions. Friday's pure volatility (volatility per unit of volume) rose to twice the level we had averaged since April--meaning that, not only were we getting more volume coming into the market, but the volume was creating twice the previous movement. 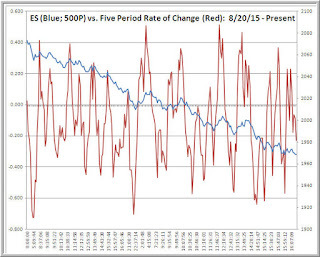 Above we see a chart of ES price movement for 8/20/15 and 8/21/15, where each data point is a closing price after 500 price changes (ticks). We had 139 price change bars for the day Friday. By contrast, there were 39 bars for the prior Friday. If we look at time as the market's clock, then every day is like every other one. Once we view movement as the market's clock (see this excellent paper), then every day can be quite different and offer very different opportunity sets. The oscillator (red line) is a five-period rate of change measure that acts as a short-term overbought/oversold measure. 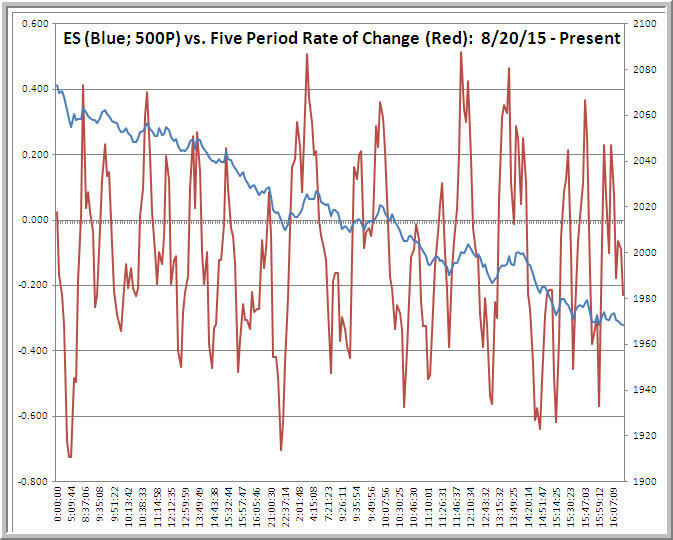 Because we print more bars when the market's clock speeds up, we see more overbought/oversold oscillations. That could create more opportunity; also more frustration and confusion. The challenge is that, using time as their gauge, most traders fail to match the market's clock: they are like dancers on a dance floor who keep slow dancing once the tune turns to dubstep. Conversely, when traders are calibrated faster than the market's pace, they overtrade, expecting more up and down movement than the market affords. Imagine playing basketball when the shot clock randomly changes from 24 seconds to 48 seconds, then to 12 seconds, and then back to 24. A team that had one way of running plays--and one time calibration--would inevitably play suboptimally.The market's shot clock changes over time, but so often we don't. It's just another example of the simple-mindedness behind the advice that traders should "follow their process." If you have *a* process, you'll get run over when markets change. It's meta-processes--sets of rules for engaging in different processes--that allow one to adapt to ever-changing markets. From the perspective of meta-process, creativity--not slavish adherence to one way of doing things--is an essential component of effective discipline.